Part 173: Bar Alphaeus. The identity of the Apostle James, son of Alphaeus, is a bit of a mystery. There has been a lot of speculation around who he actually was and what sort of role he might have played in the spreading of the Christian faith. With that said, there is no doubt that he is listed as among the twelve disciples of Jesus Christ in the Synoptic Gospels (Mark 3:18; Matthew 10:3; Luke 6:15). Aside from being listed in the Gospels as one of the twelve, nothing else is mentioned of him, making him an elusive character both in historical terms as well as in trying to sit and write a devotion about him. Early Christian tradition equates him with James the Younger (aka James the Less). Thus, this particular James is also the son of one of the women (also named Mary) who was a witness to the crucifixion of Jesus (Mark 15:40). This James is not to be confused with James, son of Zebedee (aka James the Greater), nor is he to be confused with James the Just, half-brother of Jesus Christ. Whoever this James was, he was traditionally understood to be distinct from those two apostles. There is a possibility that he was the brother of Levi, son of Alphaeus (see Mark 2:14), the tax collector who became more commonly known as Matthew. Again, not a lot is known about James, son of Alphaeus, as he is only listed in the Gospels as one of Jesus’ twelve disciples. All we have to go on, outside of the Gospels, are the traditions of the early Church Fathers. 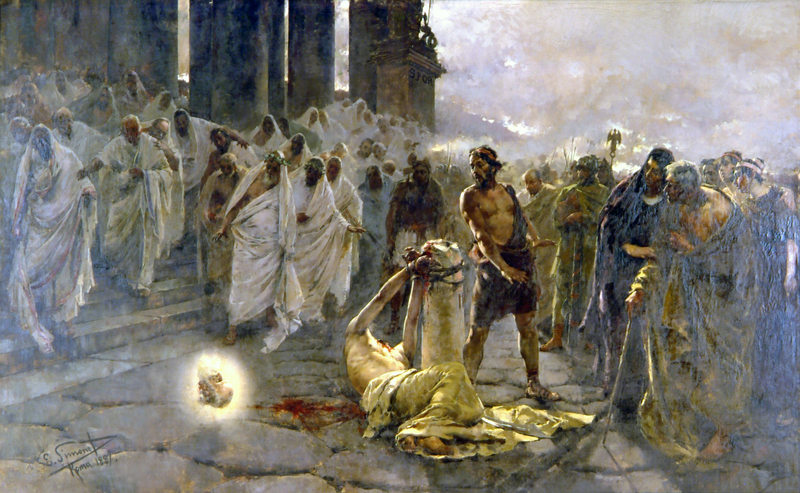 Hippolytus of Rome (c. 170-235 AD), for instance, claimed that James, son of Alphaeus, was stoned to death while preaching the Gospel in Jerusalem in two of his works, On the Twelve Apostles of Christ and On the Seventy Apostles of Christ. The documents alone do not prove that James, son of Alphaeus truly died in the place or the manner that Hippolytus claims, and it is uncertain whether the aforementioned writings were actually written by him. Still, as to James the Lesser’s ministry and martyrdom, they are all we really have to go on. Regardless, what it shows is that James, son of Alphaeus may have been proclaiming the Good News of Jesus Christ to the Jews in Jerusalem, just as James, son of Zebedee and James the Just (Jesus’ half-brother) were doing. While all this can ever be is speculation, what is not speculation is that Jesus’ teachings and miraculous deeds lived on through his disciples. After he resurrected and ascended to the Father, Jesus’ disciples went on to carry the Jesus movement further. Despite their flaws, that faith would eventually overtake the very empire that sought to snuff it out by crucifying our Lord and Savior. That movement is still very much alive today and, like the earliest disciples, the church is not without its flaws. The challenge for us is to evaluate our own faith and our own relationship with our Lord Jesus. Do you believe he is Lord? Do you believe that redemption and salvation rests solely in Jesus Christ and has been given to you? Do you believe that the Holy Spirit, whom Christ sent to us, is transforming you and leading you out to boldly witness to the Good News of Jesus Christ? If so, then be challenged to further God’s Kingdom on earth just as it is in heaven. Lord, thank you for your sacrifice for me. Use me as a holy and living sacrifice for your glory, so that more may come to know and serve you. Amen. Part 170: Bartholomew. In the last devotion, we spoke of Nathanael who at first was skeptical with regard toward Jesus ’identity. Jesus was from Nazareth, a tiny Galilean village with maybe a 150 people living in it. What good could possibly come from that little village, which was made up of known troublemakers at odds with the political and religious institutions of their day? If God was going to send the Messiah, it was far more likely that God would stick to what had been prophesied and have him come from King David’s hometown of Bethlehem. What’s more, the Messiah would come from a people who could gain the support of the religious and political establishment, and someone from Nazareth was the least likely to do that. As was mentioned, Nathanael was only ever mentioned about in the Gospel of John; however, Philip is mentioned in all four Gospels. In John’s Gospel, which is the latest of the four Gospels to be written, Philip is close to and paired with Nathanael. In the Synoptic Gospels (e.g. Mark, Matthew, and Luke), Philip is close to and often paired with Bartholomew. On top of that fact, Bartholomew is never mentioned in the Gospel of John, but is only present in the Synoptic Gospels. What does this tell us? This tells us that it is possible, perhaps even probable, that Bartholomew and Nathanael are the exact same person. What we do know is that Nathanael is a Hebrew name meaning, “God has given.” We also know that John’s Gospel originated from a Jewish disciple of Jesus’ known as “the Beloved Disciple”, who may or may not have been the Apostle John. It was completed in the 90s CE by a Jewish Christian community originally founded by that disciple. We know they’re Jewish by the intra-Jewish dialogue found throughout John’s Gospel and through the the Johannine writings altogether (e.g. Gospel of John, the letters of John, and Revelation). The name for Bartholomew is Aramaic for bar Talmai, or son of Talmai. In the Synoptic Gospels we do not know Bartholomew’s first name, only that he is the son of Talmai. In the Gospel of John, we do not know who Nathanael is the son of, just that his name is Nathanael. It is possible, reasonable even, to draw the conclusion that the two are one and the same person, especially when we see that they are both linked with the Apostle Philip. We do not know much beyond that regarding Bartholomew. We know that, given John’s account, he was skeptical at first of Jesus; however, his skepticism didn’t last long. Once Jesus revealed himself to Bartholomew, he became one of the twelve and was among those who even witnessed Jesus’ ascension following his resurrection. What’s more, Bartholomew went on to preach the Good News in India and, eventually, in Armenia where he was martyred. Current scholarship, however, does not believe he made it to Armenia, but that he was martyred in India. According to ancient tradition, Bartholomew was martyred for his faith by being flayed (aka skinned) alive, hung upside down, and beheaded. As grisly as that is, it begs of us this question: how unwavering is our faith? Do we believe that Christ is who he said he is? Are we so convinced that we’re willing to risk it all to bring Christ’s Gospel to the lost, the hurt, and the broken? Christ expects no less of us and, no matter where our skepticism may or may not lie, Bartholomew’s faith gives us hope that we, too, can grow in our faith and make an impactful difference for God’s Kingdom. Martyr, in Greek, means witness. Let us witness to the love, the grace, the resurrection and the life found in Jesus Christ. Lord, I submit myself to your will. Reign in me your love, grace, resurrection and life. Amen.